To be innovative, you must have the ability to see past the average. You must not be afraid to act on inspiration to create something better or something unique. You must be eager to take a risk and act on the spark of invention that sets a brand new idea in motion. When creating things from thoughts and ideas, we draw inspiration from what has delighted us and what we’ve learned by creating successful products. 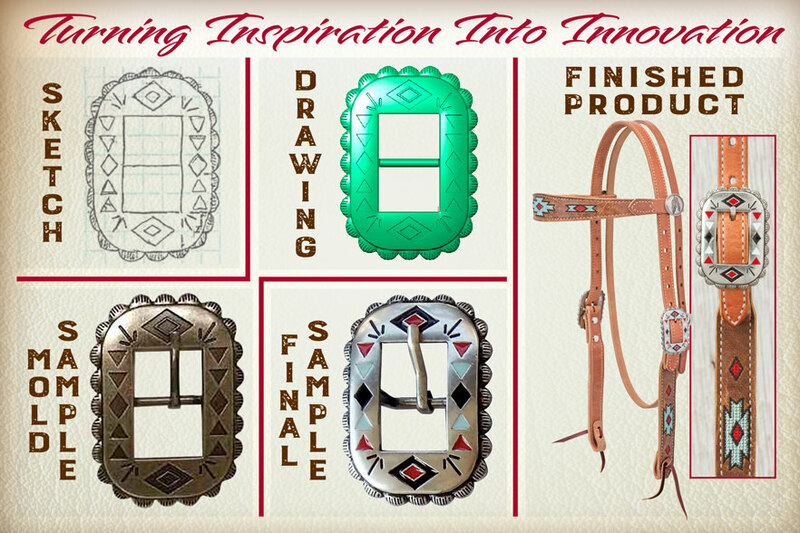 As a creator of leather horse tack, I was running into some design challenges. I realized it’s not about reinventing the piece of tack I’m creating, as that worked just fine; it was finding out how to make it more relevant and distinctive. I was faced with the challenge of choosing the right hardware to complete my collection. I was finding old and tired options that were used over and over again. I didn’t want the collection to look like what everyone else was selling. I had a specific look I was going for and I found nothing that would complete it. That’s when I decided to create my own designer hardware. With some inspiration and some sketch paper, I drew up some designs that I thought I would fit the look of the collection. That’s where it starts, from a yearning to be unique and stand out from the boring, from a desire to be recognized for an exclusive product. When thinking about starting any craft or project, turn inspiration into innovation by thinking beyond the final result. Consider how your product could solve a problem; you might be surprised to find that you will have created a better and more unique version from the original design. Innovation is thinking beyond the result, knowing each and every idea starts as a spark and develops into something remarkable. As Chuck Dorsett (from Weaver Leather Craft Supply) always says, “Use this idea as a jumping off point,” and there it starts. Good luck with your projects. Leather tanning and leatherworking are some of the oldest professions known to man, but acquiring leather has not always been as easy as going to weaverleathersupply.com and having it delivered to your doorstep in several days. Back in the old days, tanning leather required backbreaking work and lots of patience because the process took up to 18 months from start to finish. Come with me as we step back in time and learn about leather tanning in years past. In medieval times, a tanner would buy hides from the butchers. The first step was to trim the hides of all the unusable parts including the head, hooves and belly area. Next he would wash the hide to remove all blood, dirt and dung that remained on the skin. The hide was then soaked in a solution of lime or urine to help remove the hair and any fat remaining on the hide. After the lime treatment, the hide would have a knife taken to it to scrape off the loosened hair. By this point the hide is fairly clean, but a new problem has arisen due to the chemicals impregnated in the hide. The first problem is the pH level is out of whack and needs to be returned to neutral, and the second problem is the hide is stiff and needs to be softened. To cure both of these problems, the hide is rewashed and then soaked in either dog or bird dung or it is soaked in stale barley or rye beer. After being washed again, the hide is now ready for the actual tanning process. Here the hide is hung in a pit with a tannin solution that consists of mostly oak tree bark and water. This is where the patience part is needed because the hide will hang here for over 12 months before it is ready for the last few steps needed to get the leather to the perfect temper and consistency to be utilized for clothing, shoes or harnesses. After a year has gone by — that is, if plague or war hasn’t taken the life of the tanner — the hides are removed from the pits and smoothed using a two-handled setting pin. They are then dried before being sent to a currier for stretching. Lastly, because no one likes stiff leather for clothing articles, the leather is softened by having grease or sometimes animal brains worked into the leather. Disgusting, maybe, but also effective. With the technology we have today, we are able to tan leather much faster and more efficiently than was possible a millennium ago, but patience still applies. It takes 30-45 days to vegetable tan leather. Hides must go through the six-step process of preservation, rewetting, dehairing, tanning, drying and roll pressing. To consistently achieve the same quality in each type of leather, the tanneries we work with check and recheck the tanning solutions and processes to ensure they are accurate and precise. This is a good example of actively waiting. If this is not performed, it will lead to issues at the end of the process when the leather is not the color or temper that it was supposed to be. 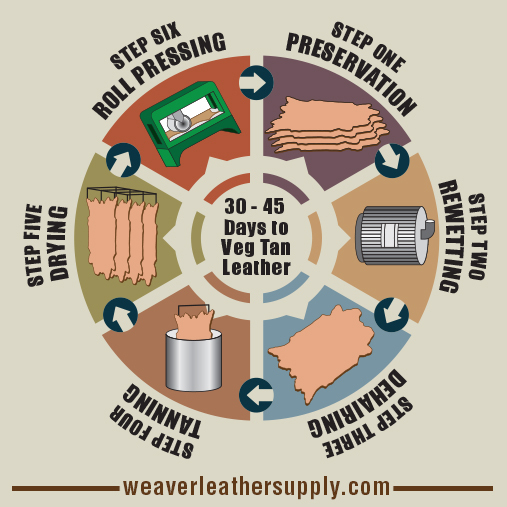 Be sure to check out more about our tannery partners at www.weaverleathersupply.com/learn/leather-101/our-tannery-partners.